Work for Idle Hands: Clickety-clack, over the tracks. I have finished George's socks. Yet another pattern from my Vintage Sock book. 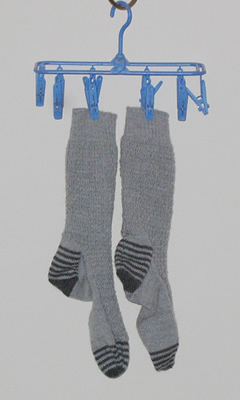 They are seen here suspended on the fantastic sock drier - a little gift from Alison. George is very taken with the stripes and is regretful that they are covered by your shoes. 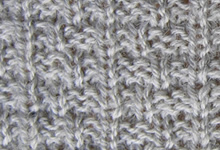 I was quite interested in the main pattern which is railway stitch. I followed the pattern "blind" as it were, and enjoyed seeing the track pattern emerge. It is obviously my aim to knit my way through this book, as I am using another pattern from it for my Noro sock wool. These are coming along very well too - I am turning the first heel.